BOSTON (MASSACHUSETTS, USA), DE FECHA 8 DE AGOSTO DE 1949. QUE DICE: “FUERA DE LA IGLESIA CATOLICA NO HAY SALVACION”. Mormon scriptures claim that the LDS church is “the only true and living church upon the face of the whole earth” (Doctrine and Covenants, 1:30). Joseph Smith stated: “This [the LDS] Church…is the only true and living church upon the face of the whole earth” (Doctrine and Covenants 1:30). President Ezra Taft Benson said: “This is not just another Church. This is not just one of a family of Christian churches. This is the Church and kingdom of God, the only true Church upon the face of the earth…” (Teachings of Ezra Taft Benson, p.164-165). Bruce McConkie stated: “If it had not been for Joseph Smith and the restoration, there would be no salvation. 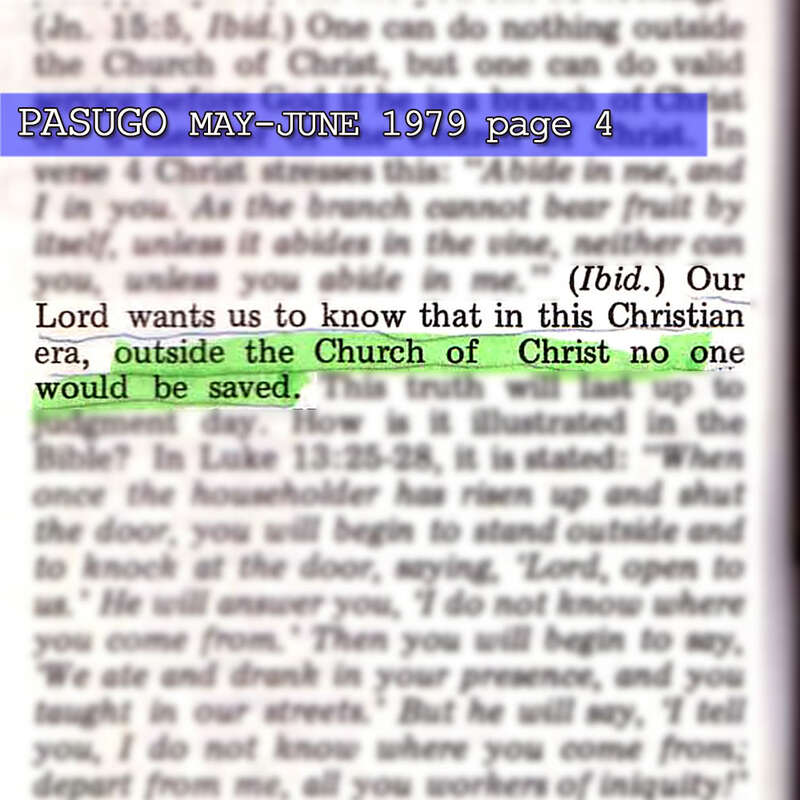 There is no salvation outside The Church of Jesus Christ of Latter-day Saints” (Mormon Doctrine, p.670). Does the SDA church also teach that there is no salvation outside their church? Conference of SDA, Canada, in Messenger, October, 1994, p 2). If one of these is right, then, all the others are going to hell! Or, are all of them going to hell because of their presumptuous judgment that they are giving without a bit of hesitation? There is one lawgiver and judge, he who is able to save and to destroy. But who are you that you judge your neighbor? It is not the belief of the only one true church in the Bible to judge those who are outside! The judgment that these religious groups are passing on to those outside of their religious caprices will be the judgment for themselves! For with the judgment you pronounce you will be judged, and the measure you give will be the measure you get. If we have to base our belief on the belief of the true church in the Bible, should we conclude that there is no salvation outside? Primarily considering reasons and logic, salvation starts outside of the true church! The first step to salvation happens outside the true church. Those that were redeemed or saved from the power of darkness or satan is translated into the kingdom (church) of His dear Son. Baptism is considered to be the formal act of affiliation or being a member of the church. After baptism, a person is considered inside the church. In the 1st century of our common era, the Gentiles, before baptism, (still outside) received the Holy Spirit. If the Holy Spirit is one with the Father and the Lord Jesus Christ in the work of salvation, then, it is Biblical to say that the work of salvation starts outside the true church! Which is this salvation? This is salvation from sins and the power of darkness or of satan. This is called salvation by grace without works because we are buried in sins in the power of darkness! How can we work or boast of any good work if we are dead in sins? Notice the verb that was used in verse 8, “for by grace are ye saved”…. is in the past participle. People in the church are saved people. Saved from sins, from the power of darkness, from the power of satan! 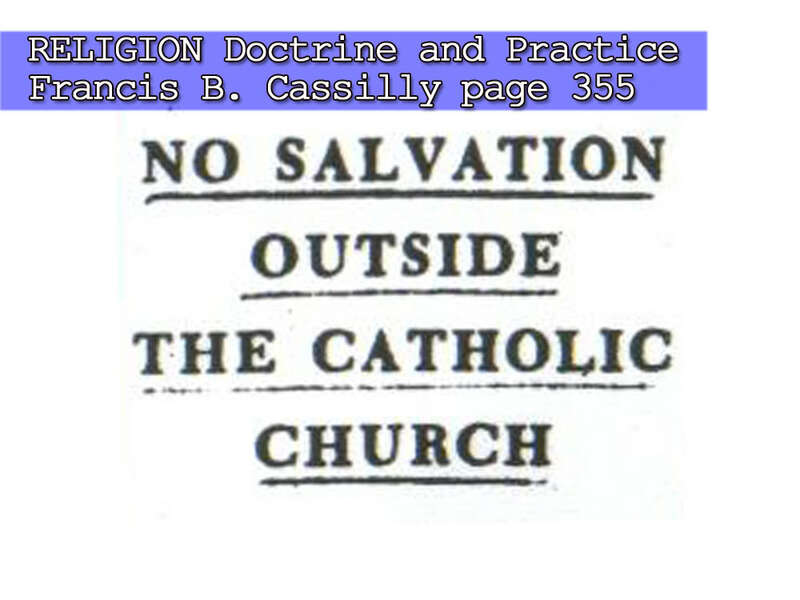 To say that there is no salvation outside the church is gross ignorance of the Bible! After being saved from the power of darkness and translated to the kingdom or to the church, what comes next? We are waiting for the coming of the Savior. As Savior, when He comes, He will be bringing salvation, other than that which was experienced by the members of the true church when they were saved from sins. This is yet another salvation, salvation from the wrath that is to come. But if we are to examine the context of the Scriptures, must we believe that only those inside the church be the only ones to be saved from the wrath to come? Let us examine this in a profound Biblical manner. The fact is, there are sheep that are not of the fold or the church. They are not among the flock. The flock is the church. The Lord Jesus Christ is saying that there are sheep outside of the flock or the church, and He will save them also! The thief in the cross was not baptized in the church, nor was numbered among the 1st century Christians! But nobody in his proper senses will deny that the Lord Jesus is going to save the thief come judgment day! Won’t this be sufficient to disprove the malicious claims and caprices of many insane religious leaders? But will the thief be just a simple exception to the rule? Are there other human beings that will be saved outside of the true church? Wait for another Biblical revelation in the next blog to follow God willing!